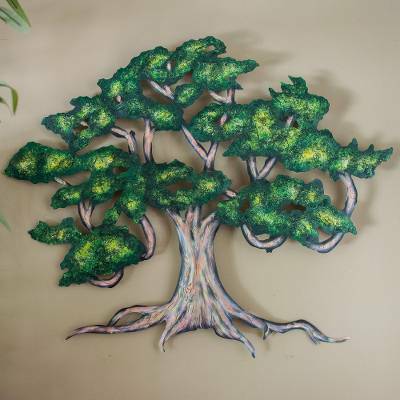 Unique Handmade Hand Painted Steel Wall Art (Medium), "Ancient Shade Tree"
Capturing the nostalgia of an ancient and venerable shade tree, Alejandro de Esesarte translates his concept to this lovely wall sculpture. He works in steel to create the images, hammering them into low relief and painting them by hand. You can find steel wall art 'Ancient Shade Tree' (medium) by Alejandro de Esesarte in wall decor categories such as Leaf and Tree Wall Art and Steel Wall Art. Enjoy exploring these sections for other Novica treasures. "I am on the autism spectrum. Because of my ASD, I could not hold a job very long. I am totally isolated from people. So I was forced to try to make my own way in order to survive. My only interactions are those needed to make and sell my art. I am obsessed with perfection and beauty, quality and detail in my metal sculptures. Novica found me at a trade show and took me out of poverty. Thanks to my artistic success, I now have economic independence and total liberty. A special thanks to those who purchase my designs. Thank you for giving me my identity and value." Alejandro de Esesarte has received 4 microcredit loans with 0% interest from Kiva and Novica, the first for $2850 and the most recent for $6000. "Looks beautiful on my wall"
This is so well made and has beautiful detail. It was the perfect touch. "This piece of Art MAKES any room"
it bring the freedom of the outdoors in and where it hangs becomes the focal point of the room wonderful piece of art. This is a lovely shade tree that hangs above my coucg. It adds warmth and depth to my living room. This Ancient Shade Tree hangs on my porch in honor of the old grandfather maple tree that shades my yard- just love it! "Great piece of wall art"
The fairy is just perfect! My wife has been building a fairy garden, and it is a wonderful edition. The fairy is a beautiful piece of art. I love my Tree of Life so much that I can't decide where I want it to hang...I want it in three places! I may have to order another one!!! The sun and moon I got was perfect!